"Freeform Murder Mysteries have become an established birthday tradition. Arabian Nights is our fourth and totally lived up to expectations. Despite illness striking 3 of our guests down at the last minute – the flexibility of the game enabled us to work round it and have a fabulous time. Our usual mix of established players and newbies worked wonderfully well and much fun was had by all. I continue to be astounded at the quality of writing these games have and can't wait to choose next year's birthday murder. Thank you, we LOVE your murder mysteries :) :)"
"Arabian Nights was awesome, and I am so glad we chose it! Fun setting too. All the characters overall seemed more involved with the main plot – which made everyone like it more too. Lots of twists and potentials. A little trickier to host because of all the potential plot outcomes, but worth it. Thanks – this was fantastic!" "Thought Arabian Nights was great! Equally as brilliant as the others (also played A Dead Man's Chest and Curse of the Pharaoh)." "Because we live in Dubai, Arabian Nights was a perfect match! We even had a real Sheikh among our guests. It was such fun especially the dressing up part. All our friends made a tremendous effort and it was an amazing evening." "Arabian Nights was such a fun game! Can't wait to try more. Here's a video of our party." "We played Arabian Nights last Saturday to a huge success! It was amazing! I instantly had requests to start planning another. You guys are great!!!" 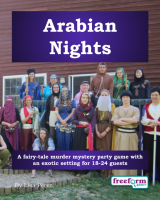 Arabian Nights is a dinner party murder mystery game for 18 to 24 guests and one or two hosts – download the free introductory pdf file. Join us in an enchanted evening of thievery, investigation, betrayal, and magic! You will be in the middle of the action and it will be up to you to wheel and deal with the other guests. Can you achieve your goals, keep your secrets hidden and survive Arabian Nights? It's up to you. Welcome to Ardalan, a small kingdom ruled by a benevolent Sultan. Ardalan has its share of troubles: the city is plagued by thieves and smugglers, including a group known as the Band of Forty Thieves. Try as they might, the Sultan's guards have never succeeded in capturing the Band's leader. However, not everything in Ardalan is corrupt. The Sultan has a beautiful daughter, Princess Almeera, who has just turned eighteen. Earlier this evening, the Sultan chose a husband for her. Dozens of princes attended the feast, but the Sultan noticed one man who was handsomer, cleverer, and richer than any of the others in attendance. So, the Sultan announced his daughter's engagement to the Prince Ala' ad-Din. Tragically, the young prince's dead body was discovered in the marketplace only an hour later. The Sultan's guards are surrounding the marketplace, and the Grand Vizier is on his way to oversee the investigations. No-one is leaving the marketplace until the murderer is found. Arabian Nights lasts for about four hours and is suited to an evening. It is often played over a meal – a finger buffet if possible to allow guests to circulate and talk in private. "I directed Arabian Nights last Friday and what a blast! It's really a fantastic game, probably one of your best :) Thanks for giving it to us, you guys are awesome :)"
The free introductory pdf file contains an introduction to the game, a cast list of all the characters, and a copy of the Marketplace Messageboard – plus details of how to buy the game. Arabian Nights is unlike many murder mystery games. Although the game starts with a murder, most of the characters have more important things to do than to investigate it. And the killing may not be over – it is unlikely that everyone will survive the remainder of the evening! Arabian Nights is played just like a murder mystery game. You may be trying to solve the murder, but primarily you are (initially at least) concentrating on your own goals and objectives. Unlike most boxed murder mystery games, Arabian Nights lets you decide how to achieve your goals and thwart your enemies. "I loved the theme of Arabian Nights! Really unique." On the evening of the game the guests are met by the organizer, the Genie, and welcomed to Ardalan's marketplace. They then receive their detailed backgrounds – including dark secrets, objectives and money. The fun then begins as they form alliances, blackmail each other, steal items and maybe even try to murder one another! Along the way they may uncover some of the mysteries of Arabian Nights. Who is the leader of the Band of Forty Thieves? Who stole the magic lamp? Who secretly loves Princess Almeera? And, of course, who murdered Prince Ala' ad-Din? Depending on what the players choose to do, there are several different possible endings, but finally everyone finds out how they did, and what secrets everyone else was concealing. Arabian Nights costs £25.00 (GB pounds) or US $39.99. You can buy it in either currency, from anywhere in the world, as you prefer. The price will be converted back into your own currency for you, at today's exchange rate. We offer a Cast Iron Guarantee on all our murder mystery games. If you're not completely satisfied with Arabian Nights then please let us know within 30 days and we will refund you. See our full terms and conditions here.